For almost as long as I've been running this site, I've gotten e-mails from people who unknowingly bought bootlegs of Cowboy Bebop merchandise. The irritating thing is that they were trying to buy the real thing, but seeing as the bootleggers are as crafty as they are with the packaging and such, they were fooled into buying an illegal product. This ticks me off no end, especially when I find that places like Ebay and seemingly respectable Anime stores refuse to do anything to protect against these rip-offs. 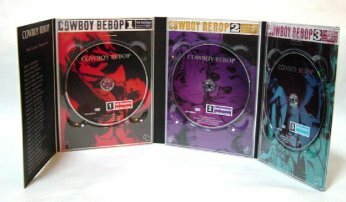 Well, I'm writing this FAQ to hopefully educate those of you interested in buying Cowboy Bebop products legitimately, who want to support the anime industry, especially great artists like Shinichiro Watanabe, Yoko Kanno (and all the crew at Sunrise) so that they continue to make the shows we love so damn much. Please do me a favor and read the sections about how to recognize bootlegs before buying a CD or DVD, especially if you're buying from Ebay. For our purposes, the technical definition of a bootleg is: any illegal copy of video or audio. That can mean everything from a program that you tape on television and pass on to a friend (yes, that's technically illegal) to someone "producing" a professional looking DVD or CD of intellectual material that they do not own the rights to. Now, in anime fandom there are some grays when it comes to what is "permissible" as far as bootlegs go. For example, I don't think that anyone, no matter how hard-line they are against bootlegging, would think that it is wrong to copy an anime on tape from a Japanese broadcast and send it to your friend in another country. It may be technically illegal, but I doubt that even the anime companies would object to this; after all, it's free advertising. Never get a fansub of an anime that's been picked up commercially. Fansubs are not a cheap replacement for the legit product. If you've bought a fansub of a program, you should buy the legit product when it's released in your area. Otherwise the legitimate companies lose money from fansubs (and eventually go out of business), which hopefully no one wants. Incidentally, these rules apply to downloadable fansubs as well. I find it shocking how many people (in the US) think it's A-OK to download episodes of Cowboy Bebop off of a file sharing client, despite the fact that it's commercially available in the United States. This is the perfect plan, if you want to sabotage anime in the US; if you want to see more anime released in this country, however, buy the DVDs. If you can't afford the DVDs, then stick to the television broadcasts. There are some people who find fansubs objectionable, period. I am not one of those people. However, I do not think that there's any excuse to buy a fansub if the video you want is commercially available in your country. Buying a fansub under those conditions is called "stealing." The next level of bootlegging is people who buy anime DVDs or VHS, make VCD or VHS copies of the programs, and sell them on Ebay. I think this is pretty obviously wrong to most everyone, and (hopefully) you can all recognize this sort of thing when you see it. And then there are "professional" bootleggers. To me, these people are the most despicable, not only because they sell bootlegs but because they try to fool their customers into believing what their buying is legitimate. Many people have been fooled by these shysters. (I was of them, unfortunately, until I wised up.) Because they package their bootlegs almost exactly the same way that the American or Japanese companies do, it can be difficult to recognize a bootleg. However, there are certain warning signs to let you know whether what you're buying is a bootleg or legit. I don't think I need to explain how to spot the copies that people make with their DVD burners and whatnot; those should be easy to spot. Obviously, if there are way to many episodes on one VCD, then you know it's just someone burning their DVDs to VCD. If you think that you do need some explanation in spotting generic bootlegs, send me an e-mail and I'll add one to this FAQ. An anime DVD produced in either Taiwan or Hong Kong should be your first tip-off. I am sure that there are legitimate video companies in these countries; however, thanks to lax copyright laws in these countries, most "professional" looking bootlegs generally come either Taiwan or Hong Kong. Therefore, seeing "imported from Hong Kong" or "imported from Taiwan" should at the very least put you on your guard. Anime bootlegs will invariably be subtitled in both English and Chinese. They might also include an English dub. But the important thing to notice are the English and Chinese subtitles in conjunction. Most (but not all) legitimate companies do not release anime with both Chinese and English subtitles. This is one of the surest signs of a bootleg. Bootlegs are always no region/all region - or in other words, they can be played on any DVD player. Once again, this is something that is almost universally not true for legitimate releases. There's one obscure Korean release of an anime that was all region, but so far that's the only one I've ever heard of. If the disk you're about to buy is all region, beware. The bootlegged disks will be incredibly cheap, especially when compared to the prices of legitimate disks. Full bootlegged series usually run about $35-$50, far cheaper than a legitimate company could get away with, because it costs money to author the disks, buy the necessary licenses, etc. Since bootleggers sidestep the expensive legal issues, they can afford to sell their disks for very cheaply. Remember: if the price looks too good to be true, it probably is. Most of the time, the bootlegged product will include fewer disks than the legit version. 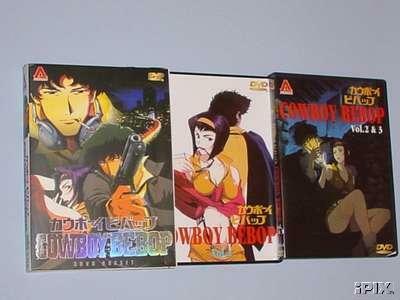 In the case of Cowboy Bebop, all the bootlegs that I've seen contain 3 disks. It should be obvious that this is a bootleg; the American release of the series was on 6 disks, the Japanese on even more than that. There simply aren't any legitimate companies that will put 8-9 episodes of a series on one disk. The most I've seen is 7 episodes per disk, and those included no extras. There are some exceptions to this rule; for example, I've seen bootlegs of Slayers that were on just as many disks as the legitimate version; so how many disks the video is on will not necessarily help you, but it's a good secondary indicator. Bootlegs tend to be badly translated. Again, this is a secondary indicator, and isn't always true. 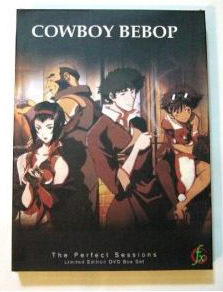 The main Cowboy Bebop bootleg that's selling on Ebay is a direct rip of the "Perfect Sessions" set that is being sold by Bandai in the USA, so it has Bandai's professional translation (here's a front view of this bootleg). However, this bootleg of the series, and this one as well have very bad translations, due to the fact that they are translated from Japanese to Chinese and then to English. As you can imagine, such a roundabout translation makes for some very low quality dialog. Video quality can also be a secondary indicator of a bootleg. This indicator isn't as reliable as some of the others, but if you're watching a DVD video and you're disappointed at the quality, then it's possible that you own a bootleg. The CD will be made by either SonMay or EverAnime; both of those companies are well-known CD bootleggers. This is an example of the SonMay logo, and here's one of the EverAnime logo. Even if you can't spot these logos on the CDs themselves, you can usually ask the seller and they'll tell you if they were produced by one of these companies. If it's a bootleg, it will be sold (new, usually) very cheaply. The thing you have to understand about import Japanese CDs is that not only are they going to be more expensive than a domestic CD, but that you also have to consider shipping charges. The prices at which the CD bootlegs usually sell is around $10 (sometimes more, sometimes less). For a legit Japanese CD, that might just barely cover the shipping charges. If someone can afford to charge that little for a Japanese CD and they aren't running at a loss, then something fishy is up. This is a good sign that what you're being sold is a bootleg. And finally, if the CD is imported from either Hong Kong or Taiwan, odds are that it's a bootleg. Just like with video piracy, copyright laws aren't very strongly enforced in these two nations. As such, they are prime locations for bootleggers. Animenation's Ask John offers some help on spotting bootlegs. Another piracy FAQ by Anime Digital that goes into more depth. I hope that this FAQ is of some use to you folks. I certainly hope that I haven't encouraged anyone to seek bootlegs. The main lesson here is: buyer beware. Just because it looks legit, doesn't mean that it is. And no matter how tempting it is to purchase a bootleg of an expensive Japanese item, please keep in mind that Japan is in economic crisis right now, and think about how horrible it would be if your favorite anime company (like say, Sunrise, the creators of Cowboy Bebop) were to go out of business because no one is spending money on their product. I know it's tough to buy those import CDs, I know it's tough to wait and save up for the DVD set you want, but waiting is preferable to the alternative. If you have further questions that you think should be answered on this FAQ, please e-mail me.